In 2017, the global supply of oil declined by 400,000 barrels per day. That spurred a rally in oil prices from $42 per barrel to $66 per barrel. That’s a 57% increase in the oil price. The Organization of the Petroleum Exporting Countries (OPEC) will attribute that to its production cuts. But that’s a lie … the truth is much darker. 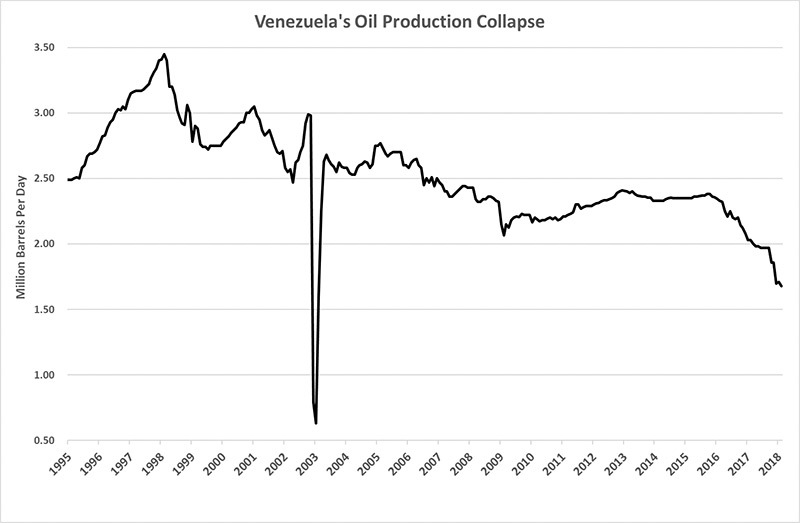 You see, if Venezuela were healthy today, we’d be swimming in oil. But the country’s political trouble killed its oil industry. That could mean a shortage of oil later this year … and much higher prices. In the 1990s, Venezuela wasn’t exactly a model country. Its government treated its oil industry like a golden goose. In 1998, the country produced nearly 3.5 million barrels of oil per day. The cash rolled in. However, there were a lot of “holes in the bucket.” Oil money enriched the powerful, while two-thirds of the citizens lived in poverty. The political backlash elected Hugo Chavez, a socialist. He immediately put his cronies into top jobs in the oil industry. They took the bulk of the country’s oil revenue and doled it out to the population. The result was that the golden goose starved to death. The oil industry is a capital-intensive business. You need to put a lot of money in the ground to get the oil out. With a conventional well, the metrics are often 10-o-1 returns on the investment … over time. So, a million dollars invested today can result in $10 million returned … over time. The chart above shows the destruction of some world-class oil fields. The part of the chart that concerns me most is the rapid decline from 2015 to today. That’s a 30% collapse, and it shows no sign of slowing. Remember, a 400,000 barrel per day decline drove a 50% increase in the oil price. Venezuela’s oil production fell an average 30,000 barrels per month in 2017. It fell by 160,000 barrels in December 2017 alone. That’s a critical situation today, because demand is rising. That means the deficit could grow from both directions … more demand and less supply. According to the International Energy Agency (IEA), demand for crude will rise to 99.3 million barrels per day, worldwide. That’s up 1.5 million barrels per day from 2017. It’s time to take another look at oil producers before the rest of the market figures this out. One easy way to do that is through the Energy Select Sector SPDR ETF (NYSE: XLE). Its top 10 holdings make up 72% of its assets. The bulk of that is in Exxon Mobil (22.6%), Chevron (16.7%) and giant service company Schlumberger (7.2%). That’s a good place to start for exposure to the oil industry.